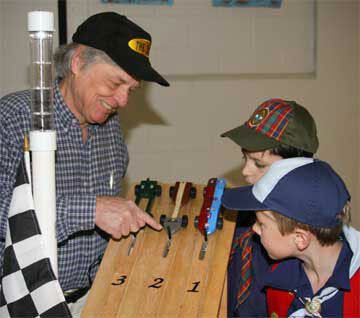 The 2010 pinewood derby season is in full swing, and I would like to say “Hi” to all the race leaders and parents involved in this excellent youth program, and wish you a very successful derby. Perhaps I might be able to help you with some of my products. 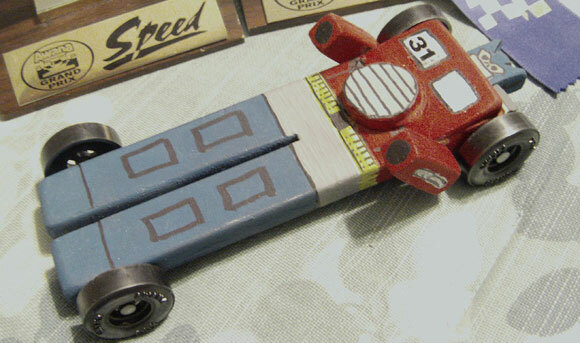 I have been involved in the pinewood derby since 1987, first as a dad helping my son get a car finished for the big day. 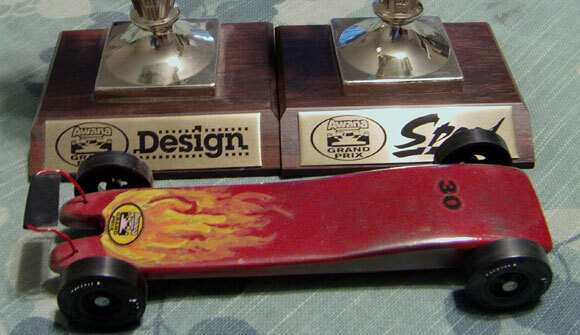 Later on, beginning in the early 90’s, I developed and offered for sale my first in a succession of pinewood derby products. You can read a more detailed story of the early days on our Web Site. The product of most interest has always been the electronic finish line. Twenty years ago, it was still the normal situation to judge the races using eyeballs. Today, however, it is the normal situation to pick out the finishing order electronically. It is a task for which human eyesight is simply not good enough. My finish line is called “The Judge”. Over the years it has evolved in outward appearance as shown below. Internally, every few years I have incorporated new electronic capabilities, and improved reliability. At the rear in Figure 1 is the first version of The Judge, which I now call the “Classic”. The Classic was available only in two, three, and four lane versions, and only gave the finishing order. However, it had one thing going for it; it used only high speed gates and flip- flops (as opposed to a digital time base), so it had significantly greater ability to split hairs. Finishing order was resolved to nanoseconds. No ties have ever been reported with the Classic. By 1996, microprocessors were getting inexpensive and powerful enough to handle not only the finishing order, but the reporting of the elapsed time back to a computer. Coincidentally, at about this time computers were getting so popular that most homes had one. The center Judge in Figure 1 shows the M Series (1996-1998), P Series (1998 briefly), Q Series (1998-2001) and F Series (2002-2004). 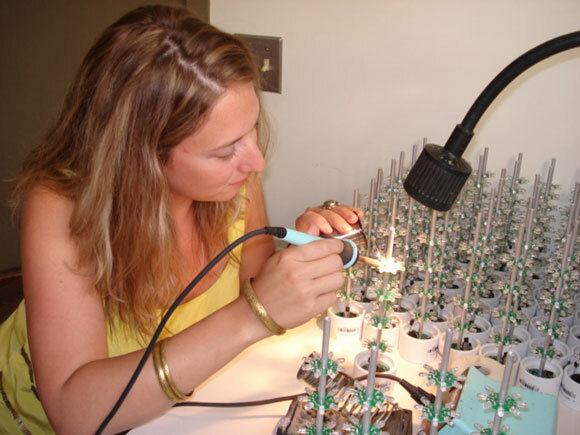 Each “Series” means a significant change in microprocessor type or firmware improvements. Outwardly, this group of Judges looked the same. In late 2004, I switched to a smaller, sleeker enclosure, and re- engineered the electronics to fit. The resulting G series, shown at the front in Figure 1 is electronically the same as the F series it replaced. The current version is the J Series, introduced in 2007 and marked by significant improvements in the firmware and a new higher performance microprocessor. Starting in 1996, all Judges have been available for tracks from one to eight lanes. A wide range of options are available to customize your finish line for your particular needs. Most Judges sold these days are equipped with the “Computer Option”, which means the race result is sent back to your computer where it is automatically incorporated into your derby management program. This greatly relieves the race leaders of most of the work as the derby unfolds. In fact, the only important thing is making sure each car is on the correct lane for every race — everything else is on auto pilot. Another popular optional feature is the ability to work in any ambient light, including outdoor operation under full sun. In the last few years, we have branched off from the finish line to offer a few ways to dress up the start line. The most exciting accessory has proven to be the Light Tree, which focuses attention on the start of each race. In fact, most groups report that everyone in the room does an enthusiastic backward countdown for each race as the lights drop to green. However, the Light Tree is not just decoration; we have developed a series of solenoid-activated latches that automatically open your starting gate when the light gets to green. It adds a touch of drama to see the cars start with nobody near the top of the track. 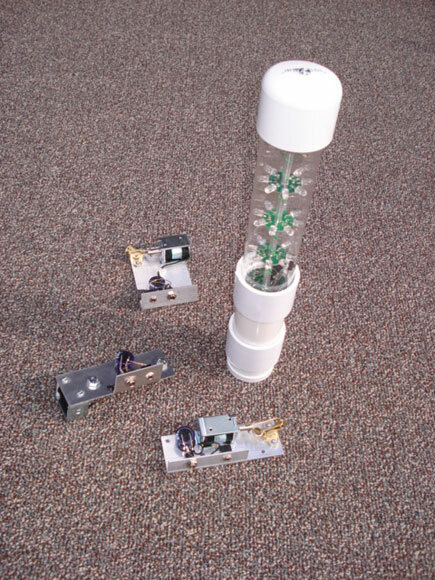 In Figure 4, clockwise from the Light Tree are: a standard plywood track latch, a BestTrack aluminum track latch, and a MicroWizard Freedom track latch. 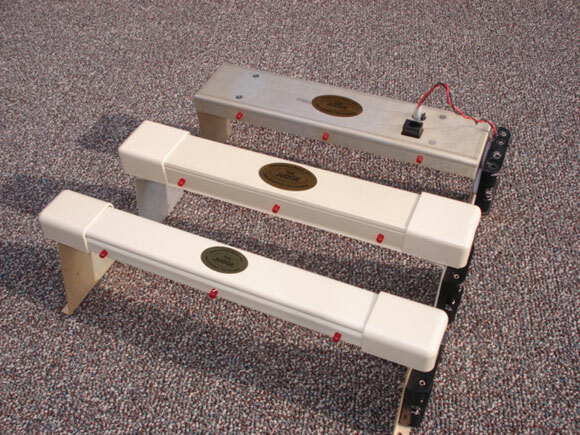 In addition to these pinewood derby products, we also offer a finish line solution designed for the BestTrack Space Derby1 track, which is also adaptable to home built tracks. Space Derby vehicles travel much faster than pinewood derby cars, so the need for electronic judging is even more critical. In addition to our standard line of pinewood derby products, I get involved in making special timing solutions for other racing formats. I have successfully used the timing circuitry of The Judge in Cubmobile and Soap Box Derby tracks, snowmobile racing, track and field timing, and industrial process controls. It has been a lot of fun and an honor to be associated with the pinewood derby program over the years; to my 4,700 customers, a big “Thank You” for choosing my products. I could not have done it without you. 1The Space Derby is a Cub Scout program which involves building and racing a propeller driven rocket ship. The ships are powered by rubber bands and race on monofilament line. We received these four cars from Tim Grimstead and his children. Thanks Tim. My 5 year old son, Rohan, won first in design for Cubbies with his Optimus Prime car and took first in overall speed. At the awards ceremony Rohan received a speeding ticket from a Sheriff Deputy and was cuffed. My 11 year old daughter, Chloe, took second in overall speed and first in design for her group with her Fireball. 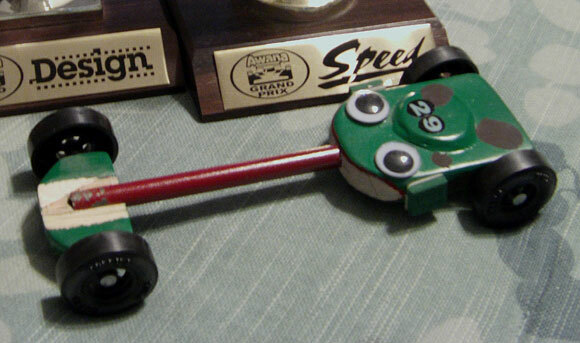 Tessa, my 9 year old daughter, placed fourth for overall speed and first for design with her Frogger car. The Frogger’s front end broke half way through the event but still placed. It was a short track; there was nothing to absorb the impact at the end. 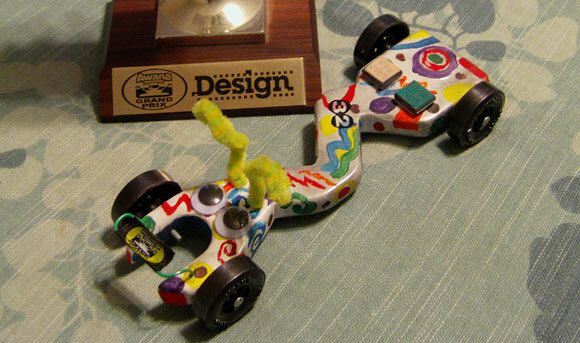 Flora, my 7 year old daughter, won first in design for her group with her Ziggity car, and ended around fifth for speed. I suspect the placing was do to the inability of the car’s front-end to trigger the timing light accurately. I was wondering if there is a recommended order to wheel preparation — what tools should be used first and what should be used last? Remove the outer step with the Pro-Outer Hub Shaver/Pro-Hub Tool. True the tread with the Pro-Wheel Shaver XT/Pro-Hub Tool. True the inside edge with the Pro-Wheel Shaver XT/Pro-Hub Tool. 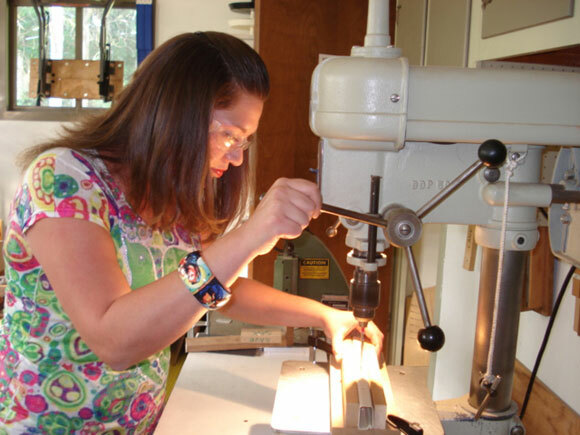 Smooth the tread surface (Pro-Wheel Mandrel & 800-1200 grit wet sandpaper) — just lightly. Polish the bore (Pro Bore Polish). Are there any of the kits that would allow me to have extended axle holes and standard slots? Our pack requires the BSA standard slots but allows for extended axles holes as well. Many of our kits can be equipped with extended holes and slots. Option 9001 adds slots to a kit or block with extended holes. This works best on the following kits: Wedge and Sports Car. It can be done on the Accelerator and Predator, but the slots would not be useable, and may be a bit unsightly. I do not recommend this option on the Vaccinator or Detonator. I have purchased the Pro-Body Tool and the Pro-Axle Guide from you. I suppose I am a little confused as to the order I should use them in, or if it is a “use one or the other”. If you use the Pro-Body tool to pilot the slots, the Pro-Axle Guide is less valuable. It will still work fine, and will simplify installation, but with care you can install axles straight without it. If you don’t use the Pro-Body Tool to pilot the slots, then the Pro-Axle Guide is really valuable. If you are trying to help a group of kids get their axles mounted, the Pro-Axle Guide is the only way to go.